Schliemann the legendary excavator of Troy and Mycenae hardly needs an introduction. A host of publications deal with the last twenty years of his life and the results of his excavations. It is only recently, however, that any interest has been taken in Schliemann’s “non-Greek” past, his early years, when he was a successful merchant, an obsessive traveler, and a compulsive linguist. What else can we call a man who taught himself to read, write, and speak more than fifteen languages? This is why we at the American School of Classical Studies at Athens (ASCSA) enthusiastically accepted the initiative of LAASA (the Lady Ambassadors and Ambassadors’ Spouses in Athens) proposing to study Schliemann’s diaries and record in detail all languages in which he wrote. In the lingo of the archivist, this is called crowdsourcing, and the members of LAASA, considering all the languages that they collectively command, was the perfect group to accomplish this difficult task. The Schliemann Project was conceived after members of LAASA visited the Gennadius Library of the ASCSA more than a year ago. During that visit they were shown the travel diaries of Heinrich Schliemann, and found them fascinating because they were written in so many languages. I still remember their excitement when we discovered that there were entries in Urdu! I was asked to introduce Schliemann to the audience and was pleased to do so, since by now he is an old friend. For the past twenty years, together with my colleagues in the Archives of the American School, I have been curating his large archive, supervising its cataloguing and preservation. Schliemann’s diaries from Mycenae and Troy are also a central feature on our tours of the archival treasures of the Gennadius Library. To understand and contextualize Schliemann’s linguistic passion, one needs, however, to look at the early years of his life, before he moved to Greece. 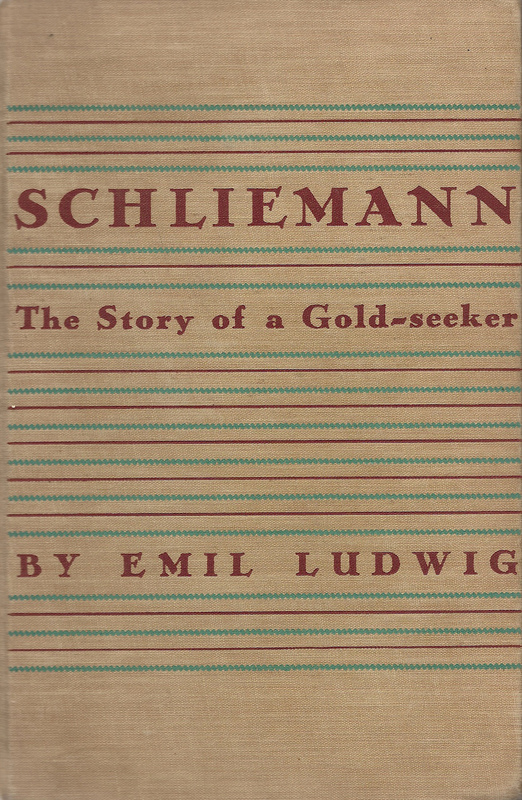 Of all the sources about his life, I chose to consult Emil Ludwig’s biography, Schliemann: The Story of a Gold-Seeker (Boston 1931), primarily because I like the style of biographies from the early 20th century. Influenced by Freud, the biographers of that period often composed psycho-biographies. Unlike the biographers of the 19th century who wrote “hagiographies,” the trend in the new century was not to spare details about the personal lives of their subjects. Surprisingly, Freud himself hated biography because he did not believe in the existence of the biographical truth. (For a wonderful, condensed history of the genre of biography, see Hermione Lee, Biography. A Very Short Introduction, Oxford 2009). Another reason why I chose Ludwig is because he was Schliemann’s first biographer. Hand-picked by Sophia Schliemann, she gave him full access to her husband’s archive. Ludwig and Ernst Meyer, a bit later, were the only Schliemann biographers who saw the archive intact. Meyer, unfortunately, was responsible for disassembling it (leading to the eventual loss of valuable documents). 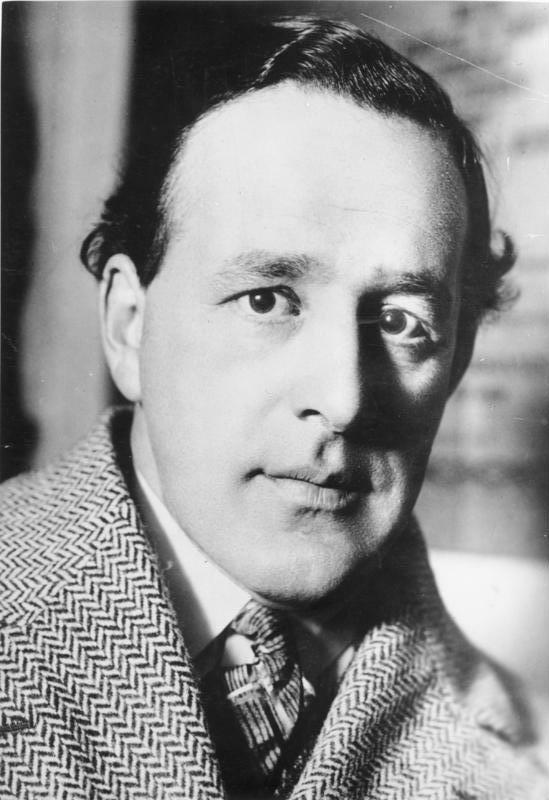 Emil Ludwig (1881-1948) was a famous German biographer of Jewish descent. By the time Sophia Schliemann and her daughter Andromache approached Ludwig in the early 1920s, he had already written the biographies of Goethe, Bismarck, and Wilhelm II. True to his school of training, namely, the writing of psycho-analytical biographies, Ludwig produced an honest biography that provides ample insight to Schliemann’s gifted but difficult and controversial personality. Yet, by not depicting Schliemann as sufficiently heroic, he displeased Schliemann’s son Agamemnon, who then invited Ernst Meyer (1888-1968) to write a more flattering biography. Ludwig also fell victim to his Jewish heritage. He was severely blamed for being critical of a true German hero, and his book was burned in 1933. Despite the obscurity into which it fell, Ludwig’s biography “is still very readable” (to use the words of Michael Wood, the famous English historian and creator of the documentary In Search of the Trojan War, 1985). Schliemann was born in the eastern part of Germany in 1822. Although the son of a priest, his childhood was highly troubled. The loss of his mother, when he was nine years old, and his father’s promiscuous life soon drove young Heinrich and his siblings out of the house. To support himself he worked long hours as a grocer’s assistant, without receiving any education after the age of 13. At 19 he moved to Hamburg with the intention of immigrating to the United States, but the ship he was travelling was shipwrecked soon after its departure. Young Heinrich hung on to a floating cask and was literally washed ashore on the sandbanks of Amsterdam. Feeling re-born and thanking his lucky stars, Schliemann did not return to Germany but decided to stay in Amsterdam to work as a clerk. “The routine nature of my work suited me very well, since it left me sufficient time to attend to my neglected education… Nothing is such an incentive to study as poverty and the knowledge that a sure means of escape from it can be found through hard work,” Schliemann wrote (Ludwig 1931, p. 29). During his Amsterdam years, 1842-1846, Schliemann learned Dutch, Spanish, Italian, and Portuguese. In the Schliemann papers in the Gennadius Library, there are hundreds of letters exchanged between Schliemann and Schroeder and Company. Heinrich entered their merchant firm in 1844 as a secretary and bookkeeper. Soon he so impressed his employers by his abilities and language skills that Mr. Schroeder promoted him once a month (Ludwig 1931, p. 30). Within two years the young man who had started as a clerk had twelve clerks working under him. But Schliemann was already planning a move to St. Petersburg to represent Schroeder’s trade interests in Russia. He had to teach himself Russian because there were no Russian teachers in Amsterdam. Over the next twenty years, from 1846-1866, Schliemann would establish himself in St. Petersburg, and, as a successful merchant, he accumulated vast riches. Within a year after moving to Russia, he took his first business trip to England and France and it was on that occasion that he began his habit of keeping a diary. An entry of his in that diary describes a signature feature in Schliemann’s character: his thriftiness. “Here again,” he notes while at Rouen, “I have followed my old practice of combining thrift with a brave show, by putting up at the best hotel but taking a room on the sixth floor. This hotel is the largest I have ever seen; it has over 500 rooms at prices ranging from 50 francs down to 2 francs. Mine costs 2 francs” (Ludwig 1931, p. 42). 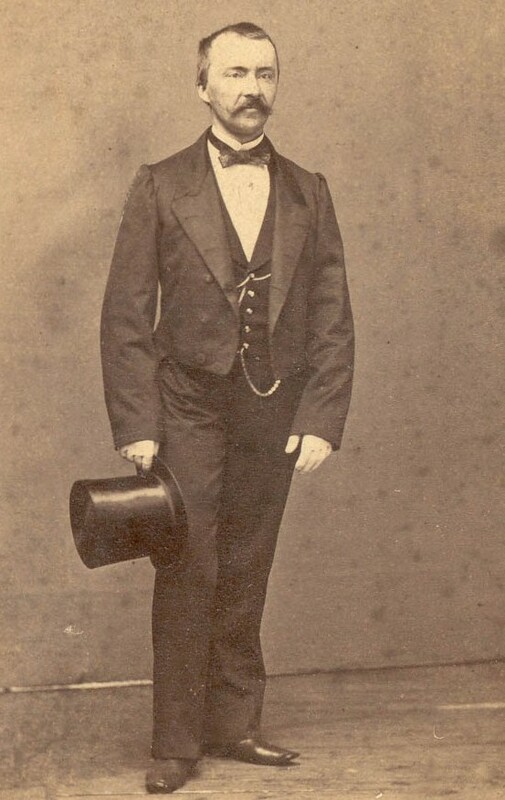 The death of his brother Louis, who had gone to America to exploit California’s newly found gold, brought Schliemann to the States in 1851. By then Schliemann was so rich and confident that he did not hesitate to request an audience with U.S. President Fillmore, and he received it. A few days later, feeling quite at home, he opened a bank in San Franscisco for the purchase of gold dust. Six months later he returned to Russia with considerable profits in his pockets. The same pattern emerges repeatedly: he was a highly energetic man who could make rapid and life-changing decisions without looking back. 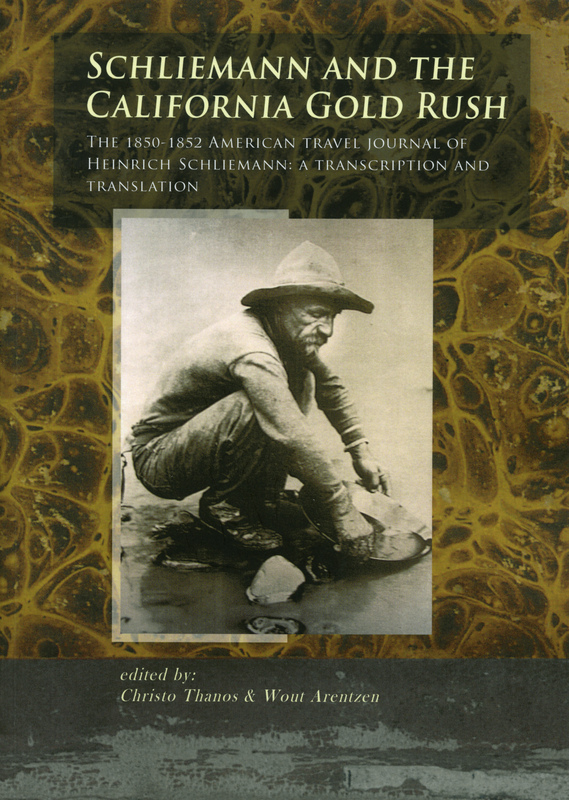 (More on Schliemann’s experience in California, see C. Thano and W. Arentzen, Schliemann and the California Gold Rush: The 1850-1852. American Travel Journal of Heinrich Schliemann: A Transcription and Translation, Leiden 2014). The following year, in 1852, he married young Katarina, the niece of a friend. He was 30, she was 18. She had already refused him more than once, but finally accepted his proposal because he had become so rich. Their unhappy union produced three children, a son and two daughters. Exhausted from hard work and the risks he had been taking, by the late 1850s Schliemann was contemplating retirement. In 1858-1859, he took a long trip to the Middle East, and on the way back he spent some time in Greece, his first visit there. Schliemann finally retired from business in 1864, at the age of 42. To escape from his unhappy domestic situation, he then embarked on a world journey that took him from Tunis and Egypt to India and China, and from there to Japan, Cuba, Mexico, and the U.S. It was during these travels that he conceived the idea for his first book, which he wrote on the boat from Japan to California, and is titled: La Chine et le Japon. On his return, a year later, he settled down alone in Paris, asking his wife to leave Russia and live with him either in Germany or France. “Never will I leave Russia” was Katarina’s answer. He would divorce Katarina in 1869 in order to marry the young Sophia Kastromenou a few months later. Schliemann was about to hit the reset button for a third time, with a new life in Greece where he would pursue archaeology and Sophia. But long before he immersed himself in these new passions, Schliemann had spent years consumed by another: language-learning. “My recreation is languages, to which I am bound by a consuming passion. During the week I am continuously occupied in my counting-house, but on Sundays I sit from early in the morning until late at night over Sophocles, whom I am translating into Modern Greek,” wrote the merchant Schliemann in the 1850s. 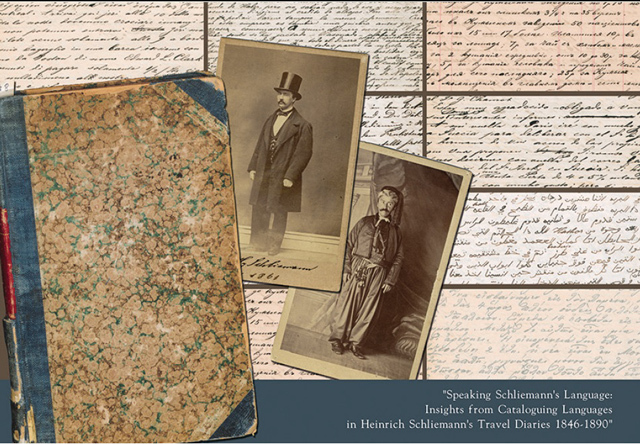 Schliemann’s travel diaries, his vast outgoing correspondence, and a huge language exercise book, are all testimonies to his unique linguistic talent in learning foreign languages. The LAASA project, which focused on his diaries, recorded twelve languages. 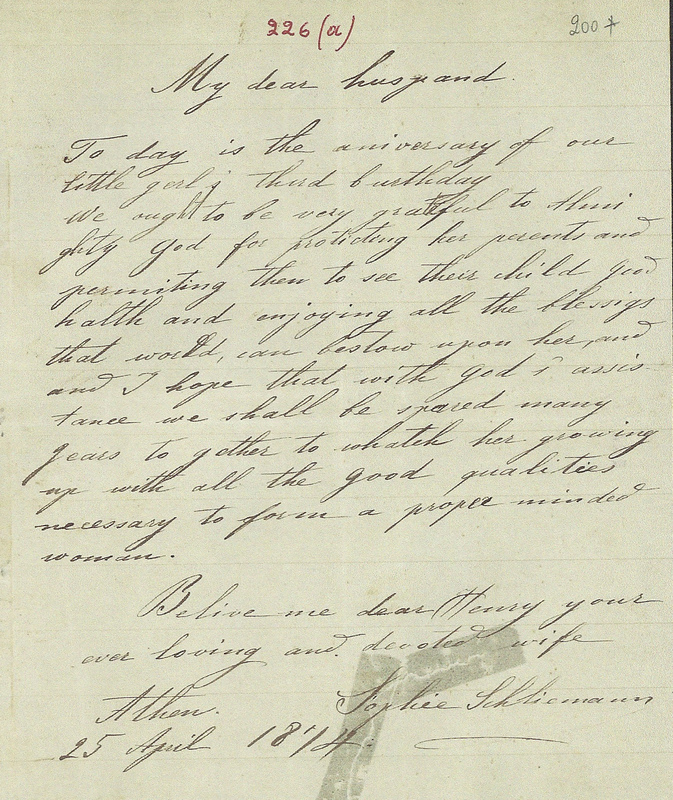 Writing to his uncle in 1855 in Greek, “the language of my waking thoughts and of my dreams,” and proud of his language skills, Schliemann informs him boastfully: “In the meanwhile, I have learnt Slovenian, Danish, Swedish, Norwegian, Polish, Latin, modern and ancient Greek, and thus can now speak fifteen languages in all” (including another seven languages he had previously learned, viz., English, French, Dutch, Spanish, Italian, Portuguese, and Russian). Schliemann’s language exercise book is filled with lots of practice letters to friends and business colleagues on any conceivable subject. 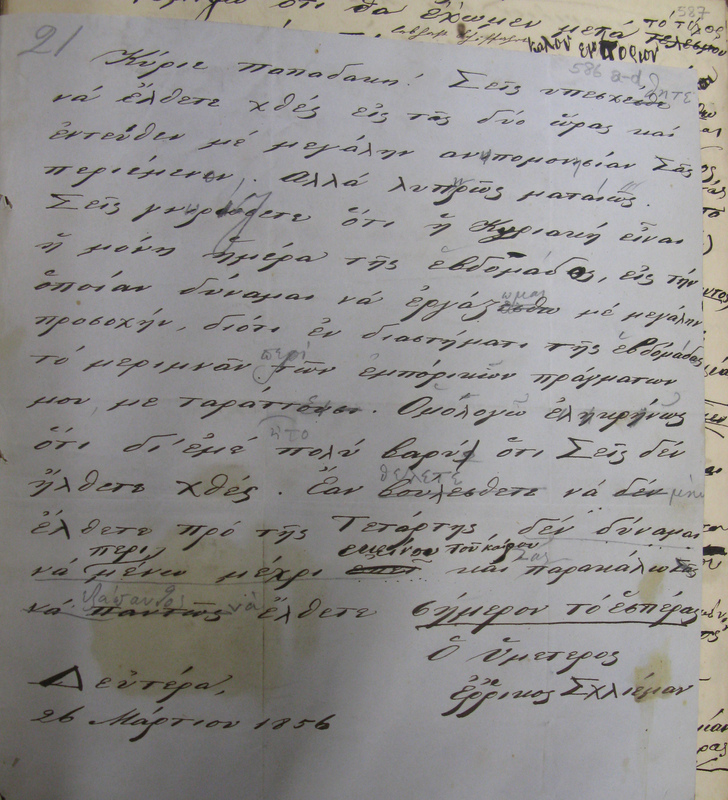 To one page Schliemann has attached a note in Greek that scolds his teacher for not having shown up for their weekly lesson. True, he learned languages for business purposes, but he could have conducted his business successfully with just German, French, English, and Russian. Emil Ludwig puzzled by Schliemann’s compulsive need to learn new languages gives his own explanation: “… Schliemann, with all his remarkable qualities, was necessarily a more or less abnormal person, who had always to be learning something without knowing why” (1931, p. 73). He also used language as “a means of control and as a sign of pleasure and displeasure” according to Elizabeth Carvalho. After his separation from his Russian wife, he never wrote to her again in Russian; he informed her of their divorce in English, and when a later their young daughter died, he tried to console her in French and German. 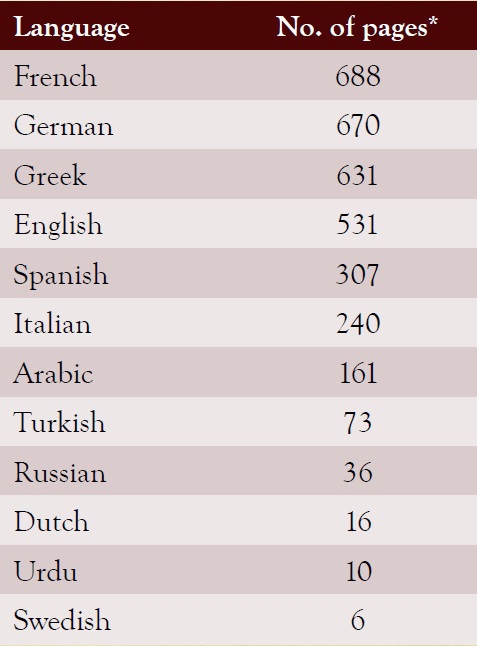 The last foreign language Schliemann learned was Turkish in the early 1870s. “I intend to conduct personally and in the Turkish language all negotiations regarding the land, and all the inhabitants of the Dardanelles and the Troad will be amazed hearing me speak the language, when only three weeks ago I did not understand a word of it.” Two years later he could write the language so well so he was praised by the Turks: “Among our people only a highly educated priest could have written such a letter” (Ludwig 1931, p. 122). Schliemann had his own method for learning languages: “reading aloud, without making any translation, having a lesson every day, writing essays on subjects of personal interest, correcting them under the supervision of the teacher, learning them by heart and reciting at the next lesson the material that was corrected the previous day” (see his autobiography in H. Schliemann, Ilios: The City and Country of the Trojans, New York 1881, pp. 10-11). Schliemann was so confident about his method that he tried to convince other people to use it. We know, in fact, that it worked in the case of his second wife, Sophia. Although Katerina, his first wife, did not share his passion for any kind of learning (a point of contention between the couple), young Sophia proved as competent as Heinrich himself. Even though she knew no language other than Greek at the time of their marriage, with perseverance and hard work Sophia managed to learn English, French, German, and Italian in a few years. When Schliemann was looking for a new, Greek wife, his most important criterion was that his future bride would be “interested in learning, for I think that it is only possible for a beautiful young girl to love and humour an old man if she is enthusiastic about learning” (Ludwig 1931, p. 113). Later after he had set his mind on marrying Sophia, he wrote again: “Sophia speaks only Greek, but she has a real enthusiasm for learning; so that I may hope that in four years’ time she will be able to speak four languages.” She did but the emotional pressure on the young woman was so great that she had a nervous breakdown during her first year of marriage. 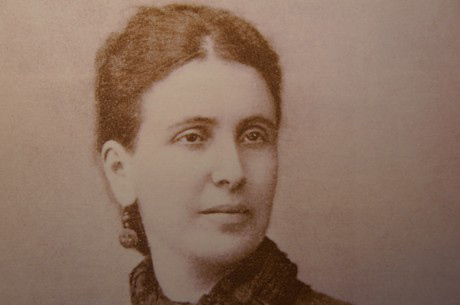 After Sophia’s attempt to end her life by falling into the Seine, Schliemann finally realized the extent of the pressure he had applied to his young wife, “… I was making her to study French four hours per day. You are right, my marital happiness and the happiness of my life lie on my wife’s health” wrote a remorseful Schliemann to one of his friends in 1870. 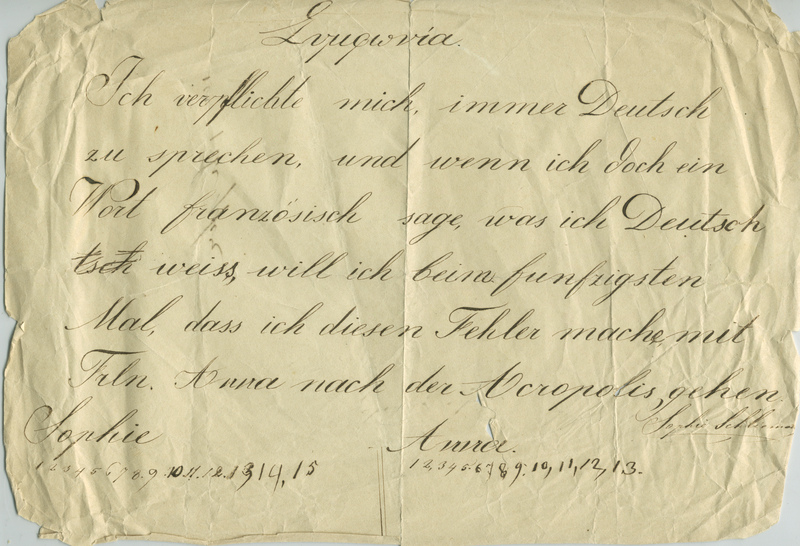 In the folder that contains Sophia’s language notes, I found an agreement in German between Sophia and her teacher Anna. Every time Sophia used a French word instead of a German that she already knew, she would have to write the word 50 times, while Anna took a stroll to the Akropolis. For the past year and a half I have been learning Italian with the help of an able and cheerful tutor, signora Francesca Tsantsizi. Most recently, like Sophia, I, too, have subscribed to Schliemann’s method of language learning. In the past month, I have, in fact, been trying to follow his advice with lots of writing, reading aloud, and learning by heart. Schliemann would have been pleased! Do you know by any chance who were his teachers, for Greek in particular? Thank you for your question. His teachers were Greeks living in St. Petersburg. He refers to one of them as “κύριε Παπαδάκη”.